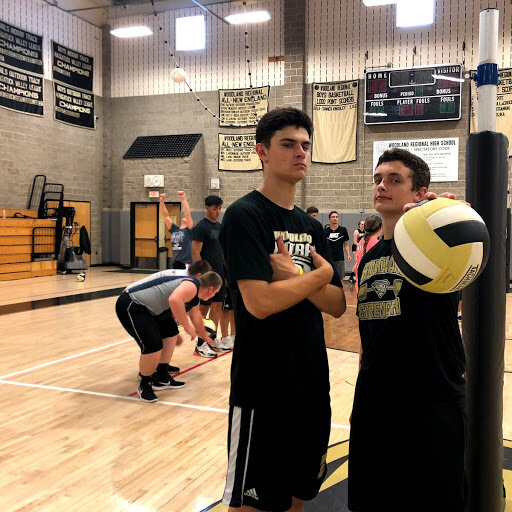 Woodland Regional High School’s absence of a male volleyball team lead to the creation of the annual event, Powderbuff, a tournament where boys of any grade level get to face off to take home the win. “I wanted to give the boys an opportunity to play,” said Layne Cronin, the event organizer of the Powderbuff boys volleyball event at Woodland. While the girl’s volleyball team has been around for quite a while, the boys didn’t have a team on which to play until Cronin decided to continue this tradition in her own fashion. Cronin’s idea to continue the legacy stemmed from her love of volleyball since she was a kid. She had also seen other girls hosting the tournament in past years, including her freshman year. Her involvement in Woodland’s volleyball team made her well versed in the sport. Though she had originally opened it exclusively to upperclassmen, Cronin later realized there wouldn’t be enough people and allowed the lower grades to compete as well. The tournament will be held today, Friday, June 8th, in the Woodland gymnasium at three o’clock. There is no entrance fee to the event, so make sure to come to watch and see which team will be victorious.